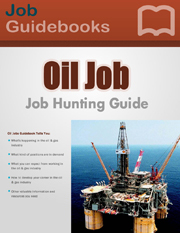 The must-have Oil & Gas Job Guide. For serious job seekers. Available Now! Get the popular version of the oil industry's must-have resource for oil & gas job seekers. All information has been updated with the newest information required to help you secure high paying employment in the oil & gas industry. All the best oil industry contact details to send your resume to. Have oil recruiters match you with the right oil job in days! Meticulously researched oil job sites. Don't waste your time on sites that don't offer results. Post your resume now! And get contacted by oil recruiters. Petroleum professionals can choose to live almost anywhere in the world: Canada, USA, South and Central America, Europe, Eurasia, Africa, and of course the Middle East. These companies are hiring now! New Oil & Gas Job Guide Available Now! Become an insider of the oil and gas industry. Make better and more informed decisions in your job search. Let our oil job guide do the heavy lifiting for you, so that you are more likely to land that high paying oil job you are looking for.